Next Saturday, November 4, Connemara connections on either side of the Atlantic will be restored when a visiting Cárna/Caiseal team plays the Connemara Gaels in a challenge for the Coley Lydon Memorial Cup at the Irish Cultural Center. The relationship between Boston and Connemara is long and deep, and the area west of Galway city has left an indelible mark on the Boston area over the decades. Wander into several bars around the town and conversations taking place in the native tongue are commonplace. Martin Walsh, Mayor of Boston, and boxer Sean Mannion, the subject of the acclaimed movie “Rocky Ros Muc”, are as synonymous with Connemara as they are with Boston. 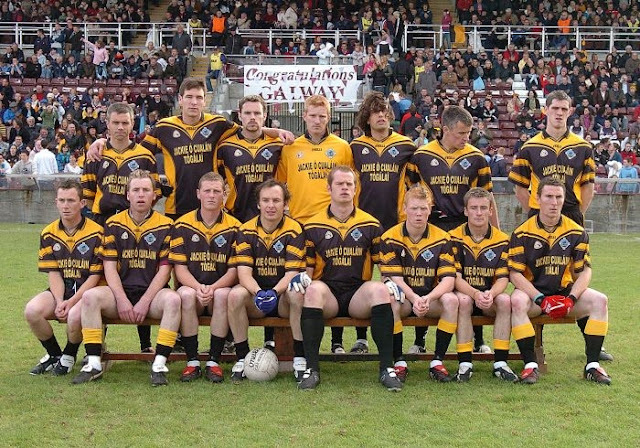 The Cárna/Caiseal team for the 2005 Galway senior football final. It is very fitting that the cup the teams play for be named in memory of Coley Lydon. A native son of Carna, and one of many who made and continue to make, the 3,000 mile journey west across the ocean, Coley was a Gaels stalwart and the contribution he has made to the club cannot be understated. Coley was a dedicated servant to the Gaels in every way imaginable, both on and off the field. There is not a committee position in which Coley did not serve and in many ways his tireless work with the club has helped to ease the culture shock that many others who have made the same journey felt, leaving the familiar surroundings of home to come to Boston. The Gaels club continues to be a home away from home to emigrants from the area, and this year it was evident with 4 Cárna/Caiseal men in the Gael’s starting lineup for their opening senior football championship match. Coleman Mulkerrin, James Flaherty, Kieran Killeen, and Sean Corbett would also be team mates with Cárna/Caiseal, and with Pauric McDonagh also involved with the Gaels, the connection between the clubs is as strong as ever. The Cárna/Caiseal club was formed with the amalgamation of Carna and Naomh Conaill in 1987, a move that was necessitated by the emigration of many young people from the area. At the time the club competed at junior B, went up a level to junior A the following year, and in 1996 made the leap to Intermediate. 2002 was a big year for the club competed at senior football level for the first time. The big prize was almost captured in 2005. Coming into the Galway county final as underdogs, Cárna/Caiseal faced a Salthill team that was led by Michael Donnellan and included Finian Hanley. The Connemara men fell by three points to a team that went on the win the All-Ireland the following St. Patrick’s Day, beating Antrim’s St. Galls in the final. Subsequent years have seen the club move up and down through the levels, currently competing at Intermediate level. Emigration has hit the club harder again recently, as was evident from the composition of the starting Gaels side in 2017. The game is next Saturday, November 4 at 2:00 at the Irish Cultural Center in Canton, and will be followed by food and entertainment at the ICC. There will be plenty of other opportunities to renew acquaintances and welcome the team and traveling party this week. JJs Irish Bar and Grille on Dorchester Ave. will host the travelers on Tuesday, Oct 31. Wednesday night it will be the 12 Bens in Dorchester, and Thursday the party will be at the Goal Post in Quincy.